Acquisition History: Two parcels comprise the WMA. The southern 2/3 of the property (approximately 40 acres) was purchased in 1964. The northern 1/3 of the property (approximately 20 acres) was purchased in 1974. Both parcels were purchased with Sport Fish & Wildlife Restoration funds administered by the U.S. Fish & Wildlife Service to provide habitat for migrating waterfowl and public access to the Connecticut River. 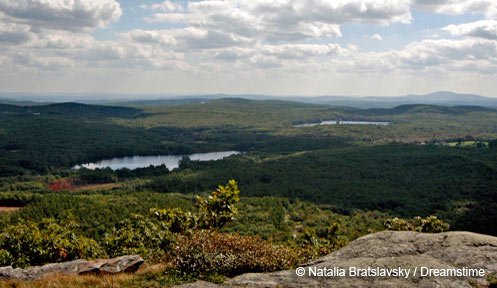 Description: Located next to the Connecticut River, the Wilder WMA provides a diversity of habitats including old agricultural fields, river backwater, emergent wetlands, floodplain forest, and shrublands. The topography is relatively flat. Common Wildlife: The Wilder WMA is highly used by migrating waterfowl including mallards, wood ducks, Canada geese, black ducks, and others. White-tailed deer and wild turkey commonly occur in this area, as do an array of songbirds including red-winged blackbirds, yellow warblers, common yellowthroats, willow flycatchers, and warbling vireos. Special Notes: Management activities on the WMA will focus on providing a grain crop for migratory waterfowl, restoring additional floodplain forest, providing adequate vegetative buffers along the river and emergent marshes to maintain water quality, and providing additional shrubland habitat for wildlife species of conservation concern. Directions: From the center of Lyme travel west on East Thetford Road. At the intersection of East Thetford and River Roads just before the Connecticut River, turn left onto River Road. The entrance to the WMA is just over one mile south of the intersection on the right.